01/07/2019 01/20/2019 - by Liam Weisman - 3 Comments. There are a couple of great laptops out there that almost certainly answer the question on “which is the best laptop to buy”. That’s because they possess the essentials ingredients that constitute a great laptop. I’m talking about a refined and improved laptop with a thin and light design, high performance and long battery life. However, more often than not, these come with a premium price tag. The likes of the Dell XPS 13, HP Spectre x360, Huawei Matebook X Pro, MacBook Pro, and Surface Book 2 all have a standard price of between $1000 to $1500. Admittedly, for most people that is to be fair quite expensive, and not in the reach of the casual budget user. And that is why I love Acer’s Swift 3 laptop; the Acer Swift 3 SF314-54-56L8 laptop. We review this budget and neat laptop below. Find out why it should be on your shopping cart if you’re in the market for a budget casual use laptop. 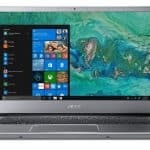 Not only is the Acer Swift 3 SF314-54-56L8 laptop deceptively powerful for its budget category. Considering its performance it’s also very well priced. We loved its simple design that takes cues from past Acer Swift laptops and secretly from the Dell XPS 13. Its all aluminum body is well crafted and finely polished for a distinct look. While it doesn’t sport a touchscreen, the display is great at Full HD and colors vibrant for the home/ office user. For all these and more it clinches our Editor’s Choice pick for budget laptops for casual use. One of the very best and defining features of the Acer Swift 3 SF314-54-56L8 laptop is its aluminum built chassis. With a metallic build, it avoids the common design pitfalls that most plastic made laptops come with. I’m talking about noticeable flex and wobbles. The design is a simple metallic case with a nice light gray finish that’s the poster child for durability. While it isn’t the fanciest or the thinnest laptop out there, it does brush shoulders with some of the greatest laptops in its category. For a start, it’s aluminum design is much more sheen and long lasting compared to the Dell Inspiron 5579. Additionally, it shares a couple of features with the HP Envy x360 15, Asus VivoBook Flip 15 and the Lenovo ThinkPad L380. The most notable among these shared on-paper specs is the Intel Core i5-8250U processor and 8GB DDR4 memory. But we’ll deal with these later on. From a dimensions point of view, the Acer Swift 3 SF314-54-56L8 measures 0.98 x 12.72 x 0.74 inches and weighs 3.2 lbs/ 1.4 kgs. Now, compared to the Dell Inspiron 5579 (15 x 10 inches), our reviewed unit is a dwarf. However, the Lenovo ThinkPad L380 and our Acer Swift 3 are 14-inch notebooks so they are relatively smaller. In terms of weight, the Swift 3 has a respectable weight. 3.2 pounds is boarder line heavy. But it won’t break your back carrying it on your backpack for school or commuting to work. Moving on, the metallic build extends all the way to the hinges and palm rest. The hinges are not visible from the front but a side view shows the angled embroidered hinges. It’s nothing dazzling compared to rivals such as the Samsung Notebook 7 Spin and the Asus ZenBook Flip because it lacks 2-in-1 capabilities. That is, it can’t contort to other modes such as tablet, tent or stand mode. But we give it props for its comfort and practicality, especially on the spacious keyboard and trackpad front. Aside from not completely emptying your wallet, the display makes use of a Full HD (1920 x 1080) screen. The panel uses In-Plane Switching (IPS) technology which means it has great viewing angles. Our one caveat, however, is that while the image is vibrant, Acer could have done better. Perhaps with adding a touchscreen and higher brightness capability, but you get what you pay for. With a 250 nits color brightness, it is not as bright as one would expect it. As a result, you won’t be able to use it under direct sunlight without struggling to view the screen. Also, the display registers an sRGB color gamut of 64% which isn’t as high. Don’t worry too much about all that if you don’t get it. It just means it’s not suitable professionals who deal with image and video editing. Those require a bit of better color precision, meaning higher color gamut. For other home/office uses, it should work perfectly. Another of the Acer Swift 3’s commendable features is the inclusion of legacy ports. Neatly tucked on the left and right-hand side of the laptop are 2 USB 3.0 ports and for futurists a single USB 3.1 Type-C port. Acer included a pint-sized fingerprint reader beneath the directional arrow keys. Admittedly, that is a nice addition to this clamshell laptop, an addition we’ve commonly seen on Lenovo business laptops. Other connectivity options on the Swift 3 is the 802.11ac Wi-Fi connector and Bluetooth 4.1. Hidden under the chassis of the Acer Swift 3 are some of the redeeming components such as the 8th Generation Intel Core i5-8250U processor, paired with an 8GB DDR4 memory and 256GB Solid-state drive. The processor offers strong performance compared to its predecessor processor, the 7th Gen 7200U. It is built for users looking for a fast laptop that doesn’t sacrifice on portability and battery life. 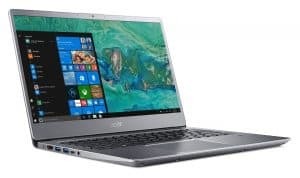 Thanks to the Quad-core Intel Core i5-8250U processor, the Acer Swift 3 SF314-54-56L8 support everyday applications, web browsing, working on Microsoft Office applications and multimedia playback. Also, the processor allows the Swift 3 to comfortably handle 4K video playback. It makes playing 4K Ultra HD videos especially at 60 fps a smooth experience. As far as thermals go, under normal working load, it can support a couple of open tabs, MS Word and MP3 player and still maintain the temperature at 40 degrees Celsius. That means, the bottom gets only mildly warm. Moving on, there is 8GB DDR4 memory. For this price point, 8GB is sufficient and it will offer more than enough power to run the system. If you are considering gaming with this laptop, perhaps some more memory would be essential. Otherwise, 8GB is decent to handle a multitasking and casual use. Some of the biggest consumers of RAM in casual use are the operating system itself, web browser, some applications and games (and other websites). If you’re prone to use other programs such as engineering CAD which is complex, the processor might struggle a bit. Add to that list Photoshop and other professional programs/ engineering software. However, if you’re not planning to use these you should be fine. We loved the fact that Acer includes a solid-state drive storage option for the Acer Swift 3 SF314-54-56L8. SSDs are fast and snappy and can handle software and applications quite well. Data hogs might prefer more storage space for video and multimedia. So for that lot, we recommend boosting the existing memory with a 1TB hard disk storage. There is an integrated Intel HD Graphics 620 card to take care of the graphics performance. It allows smooth video playback so you can stream YouTube content without noticing much strain. This GPU is the equivalent of AMD’s RX Vega 8 and they are almost at the same par, both with the capacity for moderate 3D performance. Gaming is not entirely impossible. You can have some gameplay on demanding gaming titles which means only on minimal settings. Check out this video on gaming on 8th Generation Intel Core i5-8250U processor and Intel HD Graphics 620. From a distance, the chiclet keyboard looks attractive and spacious. Spacious is the key word here because the keyboard lacks a number pad which while being a bonus for space, might be a wrinkle to other users. The keyboard is backlit which adds a nice touch to the already sophisticated look. Meanwhile, the trackpad is also impressive considering the plenty amount of space available. Also, the trackpad is Windows precision configured so it easily picks up on hand gestures. Generally, the trackpad is easy to use and you won’t experience any dead clicks while tapping or scrolling. The Acer Swift 3 packs a powerful 4-cell Li-ion (3200mAh) battery in its corner. Acer promises 12 hours of life but in reality, it adds up to 5.5 to 8 hours on casual use and 4 hours on intensive gaming and graphics use. Compared to other rivals in its path, the Swift 3 battery life is wholly unsurprisingly low. It beat out the Asus ZenBook UX310UA (4 hours 13 minutes) but succumbs against the Dell Inspiron 15 5579’s 7 hours 15 minutes. There’s more to love than hate on the Acer Swift 3 SF314-54-56L8 laptop. Ranging from a decent design and aesthetic, plenty of ports (including the futuristic USB 3.1 Type-C port), Full HD display, premium processor and components, the Swift 3 makes a name for itself in the budget laptop sphere. The keyboard and touchpad are also a step in the right direction and an inspiration for its rivals. Evidently, it is an impressive laptop with great promise. So and if you can overlook it’s few trade-offs such as lack of touchscreen and hard disk storage it is a laptop worth going for. 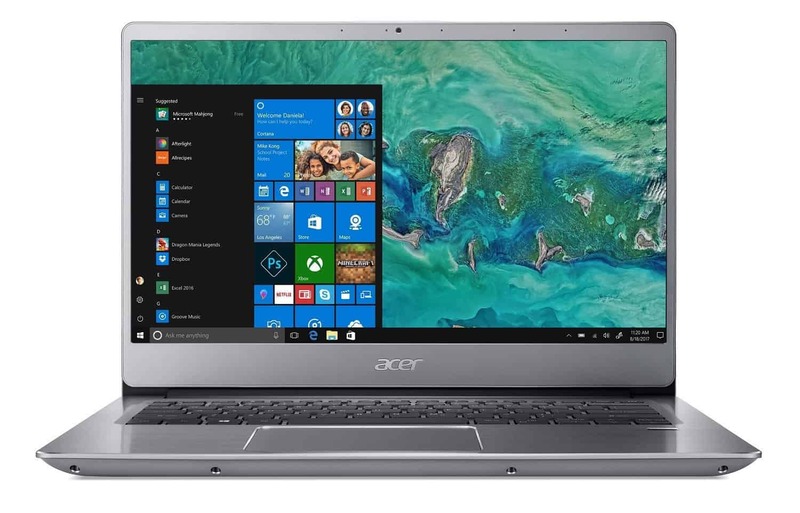 You can’t get a better offer than the Acer Swift 3 SF314-54-56L8.